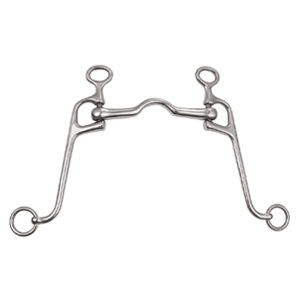 These low leverage training bits are commonly used as a transition bit from a ring snaffle to a fuller shank bit and can be used by any level of rider needing a softer feel. 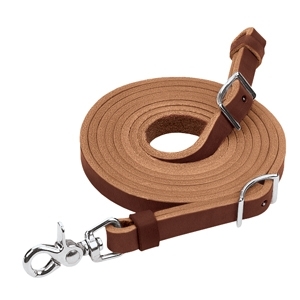 Designed to be used with a curb strap, these bits help introduce young horses to curb pressure. Please note: Horses should never wear a bit when tied. 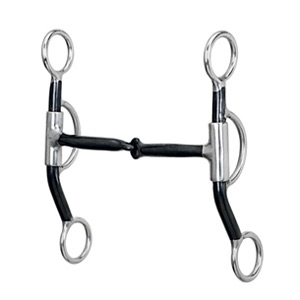 This stainless steel/black steel training bit features a 5" slightly curved snaffle mouth with copper inlay and 6-1/2" loose cheeks. 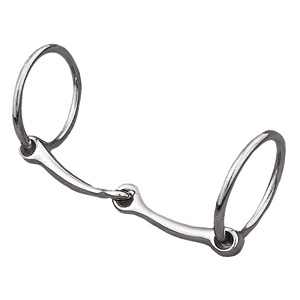 This stainless steel walking horse bit features a 5" mouth and 8" loose shanks. 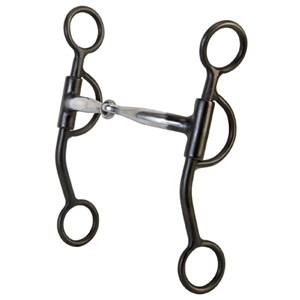 Designed for riding, training and showing, these bits are great for any horse and any level of rider. Shorter shanks on a bit provide a softer feel to the horse while bits with shanks 8" or longer provide a faster response from the rider’s hand to the horse’s mouth. As with any bit, the quieter the hands, the less severe the bit will be. Please note: Horses should never wear a bit when tied. 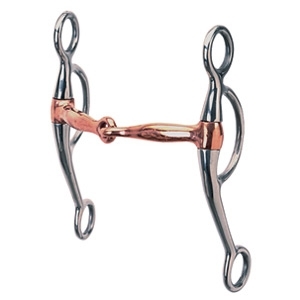 This stainless steel bit features a 5" copper plated mouth and 6-3/4" loose cheeks. This is the same quality-made, original Weaver halter you've come to know and love! With top quality nylon construction, heat-sealed oblong buckle holes, box-stitching at stress points and true-to-fit-sizing, this will be your go-to halter. 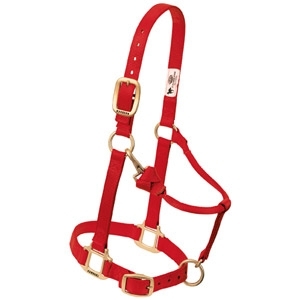 This 3/4" halter features a convenient, adjustable design, a flat throat and brass plated hardware (except looped-on throat snap is non-rust solid brass). Arabian/cob size. This premium polypropylene lead is sized for mini horses and ponies and has a soft, broken-in feel you'll love! 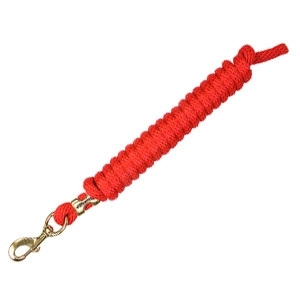 Features a non-rust solid brass 225 snap. Measures 1/2" x 7'. Large horse or 2-year-old draft size. This is the same quality-made, original Weaver halter you've come to know and love! Most colors available. Average horse or yearling draft size. This is the same quality-made, original Weaver halter you've come to know and love! Most colors available. 1" small horse or weanling draft size. Most colors available. This is the same quality-made, original Weaver halter you've come to know and love! Quality-made from smooth, refined premium English bridle leather, these reins feature a simple, single-ply construction. Smoothed and darkened leather edges provide a classic look and a great feel in your hands. Chicago screw bit ends. Measure 5/8" x 7'. Chestnut. A great basic rein at a great price! 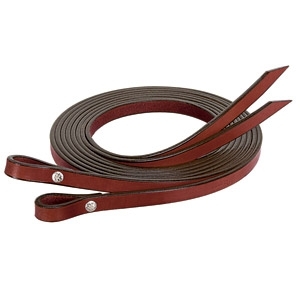 This simple, single-ply rein is constructed from soft, supple burgundy latigo leather for a great feel in your hands. 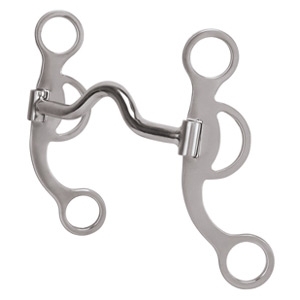 Features a durable nickel plated scissor snap and conway adjustments. Measures 1/2" x 7-1/2'. The Horizons Collection offers great basic tack perfect for everyday riding. Handcrafted from durable, weather resistant harness leather, this rein features a nickel plated scissor snap and nickel plated conway adjustments. Measures 5/8" x 8'. 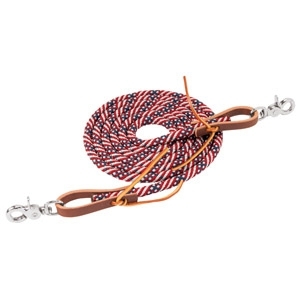 Exciting color combinations give this poly roper rein a fashionable look you'll love! This quality roper rein features sunset harness leather water loops at both ends with alum tanned leather laces and nickel plated scissor snaps. You'll appreciate the great feel this rein has in your hands. Measures 3/8" x 8'. Black (S1) or brown (S9). 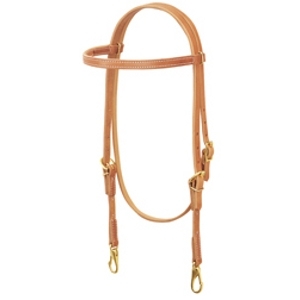 A halter and bridle in one! 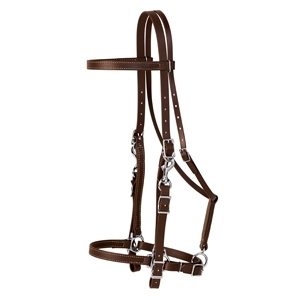 This Brahma Webb® halter bridle offers the look and feel of leather with the easy care and convenience of synthetic webbing. 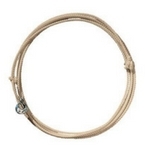 You'll love the low maintenance and weather resistance of this halter bridle. Durable nickel plated hardware. Horse size. 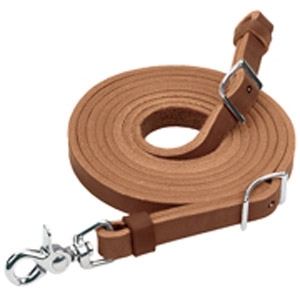 This single-ply 5/8" headstall is constructed from durable, weather resistant Hermann Oak® russet harness leather for dependable service. 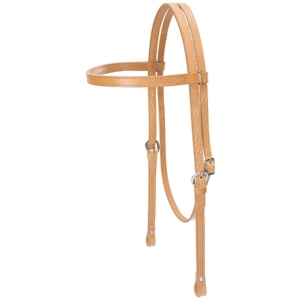 Features a doubled and stitched browband and double cheek adjustments for a great fit. Non-rust solid brass hardware (including the snap bit ends). Horse size. 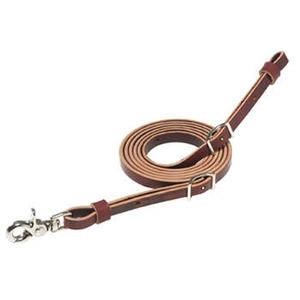 Constructed from soft, supple burgundy latigo leather, this single-ply 5/8" headstall features precise stitching and alum tanned leather lace water tie bit ends. 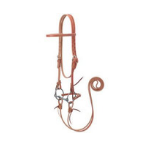 A great headstall at a great price! Durable nickel plated hardware. Horse size. 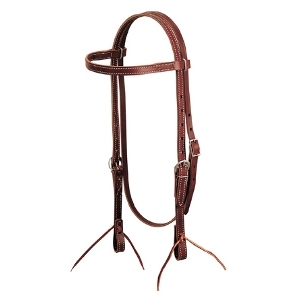 Soft, supple burgundy latigo leather lines this rugged, doubled and stitched 5/8" Hermann Oak® russet harness leather headstall. Features double cheek adjustments, burgundy alum tanned leather lace water tie bit ends and a single-ply throat latch. Non-rust stainless steel hardware. Horse size. 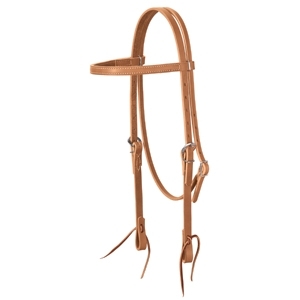 On-trend, wheat-colored stitching is the perfect accent to this 5/8" golden brown harness leather headstall. 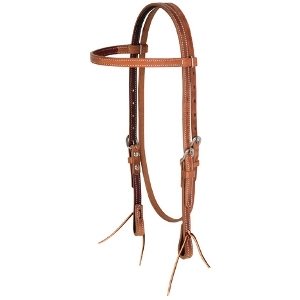 This headstall features a doubled and stitched browband, a single-ply throat latch and brown latigo leather ties at bit ends. Nickel plated hardware. Horse size.